Posco at John Moores has been investigating the overhead of lightweight virtualization on a Raspberry Pi cloud infrastructure. His work is published in a recent issue of the Microelectronics journal. 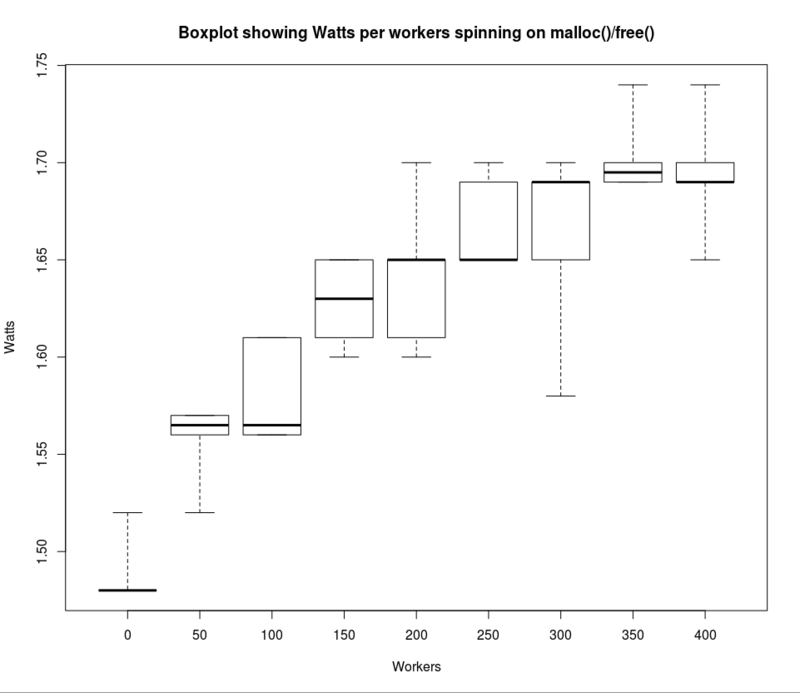 Headline – virtualization does come at a price, especially for compute-intensive workloads. Jeremy has stuck Raspberry Pi sensor nodes all over the School of Computing Science at Glasgow. The sensors gather environmental data – check current status here. This is part of Glasgow’s smart campus initiative. His work will be published in the IEEE FICloud 2016 conference. Kubernetes Dashboard – Run as Docker Image on Raspberry Pi 2. The docker image has now been fixed for ARMv7 by the Google Kubernetes Dashboard team as of 19th January 2016. Due to the change in the code, you can now build and run Dashboard in a Docker image, rather than having to serve it or use ‘Screen’ as per my previous blog post here. This then downloads and checks the latest files against the currently installed files and updates them accordingly, as shown in the below screenshot. You will need to change the IP address of the Api server host to match your Master node, in our case our Master is on 192.168.1.201. The dashboard should now be running in a tiny docker image, without the need for screen or an active running terminal. Thank you to Piotr Bryk for updating the build code and fixing this issue! Keep an eye on the Kubernetes github here for further updates as they seem to be coming in thick and fast and you can update your Dash at any time, using this method. Google are currently working on a Dashboard UI for their Kubernetes orchestration tool. This is still a work in progress and not yet ready for production, however, they aim to have a BETA release end of January and a stable release towards the end of February. We have managed to get this working, ready for the BETA release. This will replace the current kube-ui. In order to get the Dashboard working, there are a number of software dependencies that need to be installed and configured first. Docker should already be installed, and we will be leaving Go till last. I prefer doing this in steps as sometimes mirror connections fail, but there is a single command, shown below the steps. 1. Open a terminal on your Master Kubernetes Node. 2. Log into the root account using su and the root password. 3. Install Node JS and NPM. 4. Install Java 7. When we were testing with the later versions of Java, we ran into issues with compiling the dashboard, therefore we stuck with JDK 7. 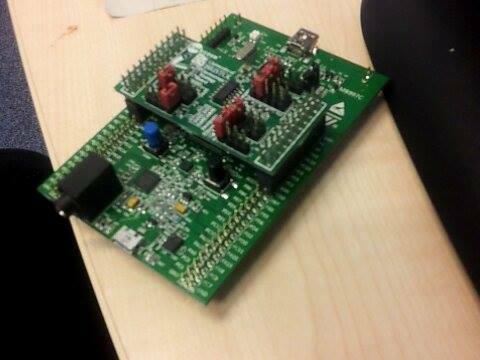 Now, we are going to build Go. At the time of writing, there is not a working version of Go 1.5 for ARMv7, therefore we have to firstly install the older 1.4.3 version from the public repository and then manually build 1.5 on an ARMv7 platform. 1. Clone the “Go” repository. 2. Change directory to “Go”. 4. Change directory to “src”. 5. Run the bash script in order to build Go 1.4.3. 6. As Go is installed in our user’s home directory, in order to reference this, we need to add the command “Go” to the user’s $PATH. 8. Check that “Go” is installed the version correctly and the $PATH has been setup. If this is not displayed and you receive an error saying “Go not found”, go back and ensure that “Go” has been added to your $PATH variable. 13. Run the script as root. Be aware, this does take a while to run and there are times when no updates are being displayed. It may also fail on the tests but running /root/go/bin/go version should show return “go version go1.5 linux/arm” once complete. 14. As we ran the upgrade Go script as root, we now need to move it from the root folder it was built in, to the alarm home folder. Firstly, we have to remove the 1.4.3 Go directory from the home directory of alarm. Log out of the root account. 15. In order to see if it is still running correctly, test go again using the file we created earlier. With the full preparation done, we moved onto building the Kubernetes Dashboard. 3. Install the dashboard packages. This takes around 3 hours and requires the terminal to stay active throughout the process. If the terminal becomes inactive or a remote shell is lost, you will have to restart the process. Fortunately, it will continue from where it stopped. You may however get an error stating that “node sass” cannot be downloaded. If you receive this error, follow the below steps to manually download it once the main install has finished. 4. Optional: Install node sass if you received the above mentioned error. This can take up to 15 minutes. 5. Log in as root and install bower. This has to be done as root, but once you have installed bower, remember to exit the superuser. Remember, this should be done in a standard user account. 7. You can see that this is up and running, as our screenshot displays the access URL’s. To view it in a browser, simply open your web browser and go to your Pi’s IP address, as shown in your terminal. In our case above, our IP Address is listed as http://192.168.1.201:9090 but yours may vary. This will show the test/debug version of the Kubernetes dashboard. 10. Open your web browser and go to your Pi’s IP address. Again, this will vary, ours was http://192.168.1.201:9090 so check the output in the terminal window to find the IP Address if you are unsure. Kubernetes dashboard should now be up and running. At present the Kubernetes dashboard requires an active terminal to be able to run, in order to bypass this, we used “Screen”, which runs a detached non-active terminal in the background, which means we didn’t need a running active terminal. This will run in the background. This will show either the detached terminal you are using to run the Kubernetes Dashboard, or it will list all the running screen processes. To reattach a specific screen process, you will need to include the screen ID produced from the above command. To completely end the process and stop the dashboard from running, use: ctrl + x on the running screen terminal. At present, the dashboard is still a work in production. Some links may not work, and is limited functonality at the time of writing this post. Keep your eye on the Kubernetes Dashboard project on github for further releases. 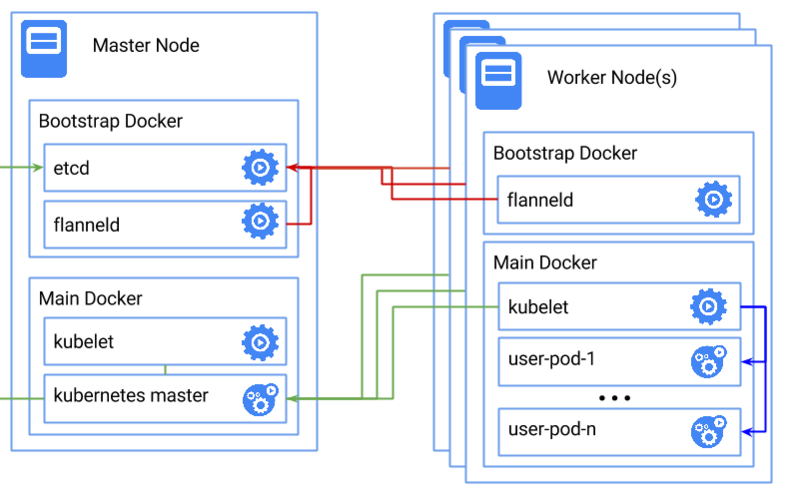 Google’s Kubernetes is a powerful orchestration tool for containerised applications across multiple hosts. We achieved the first fully running implementation of Kubernetes on Raspberry Pi 2 today, and thanks to the ease of docker, you can too. Select a Pi to be Pi master, and ssh in. I recommend that you to su root for the following. Then run the this command to bring up docker-bootstrap. Then we need to bring up etcd, the key value store used by Kubernetes. This command and any other docker run command with a new container might take a little while when first running, as docker will need to download the container. I’m working on shrinking the images to make this less of a pain. Now we need to stop docker so that we can reconfigure it to use flannel. Then we need to get its subnet information. Now we need to configure docker to use this subnet, which is very simple. All we need to do is edit the docker.service file. Then change the line which starts with ExecStart to include the flags –bip and –mtu. It should end up looking something like this. Now we need to take down the network bridge docker0. Now it’s time to launch kubernetes! You should see your node appear. Now for the first worker node. These instructions be applied as many times as necessary to gain however many worker nodes you need. We’ll need a docker-bootstrap again for flannel. And add flanneld. This node doesn’t need etcd running on it, because it will use the running etcd from the master node. You should get a 404 response. As before, we need to get the subnet information. Now we bring down docker’s network bridge and reload it. Running kubectl get nodes on the original Pi should now return both nodes. It’s been a busy fortnight. Much has been done, so I’ll get straight down to business. Hadoop, being java based, was not overly difficult to package into a container and get running. However, proving that it was capable of networking between containers or even hosts looked like too much of a time sink, and so it has only been tested out as a single node. You can find the dockerfile here, and the container itself here. stress -i 250 –vm-bytes 4 -t 25 -d 2 -m [VARIABLE]. As you can see, for larger files the Pi 2 is slightly slower, but we’re not sure why yet. It may well be the larger data capacity of the micro SD cards. It was then time to stress test our defenceless Pi Cloud. I used SaltStack to send a punishing stress command to all 14 Pis, which they had to maintain for ten minutes. Each rack of seven suffered one failure. A single Pi could grind through this command, but the strain of seven was too much for our measly three amp USB hubs, but we have some new ones due for delivery on Monday. This of course means we’ll have to redesign the towers again, but then the struggle towards perfection is eternal, and sometimes fun. A 3d model of the finished design will be made freely available for replication when we have it. The other fruits of my labour can be found in my docker hub repository, here. I’ve learned one of the most valuables lesson of my internship this week, and it’s definitely the most counter-intuitive one so far. It was also the most vexing. The most annoying lessons that we learn in our life are never new pieces of knowledge, gifted to us by beautiful books or articulate articles. Nor are they the cascading of connections and clicks as assorted bits of information leap together and join up. No, these lessons are ones which take a long time to learn and make us feel very embarrassed for a good while afterwards. They are not the creation of new knowledge, instead they are the destruction of misconceptions. This week my misconception was the necessity of updates. It doesn’t exist. Updates are a swindle and a lie. If a system is working, don’t change it. Don’t, for example, command all your nodes to update their most vital piece of software when there is absolutely no need for it. I really recommend that if you think that your machines do need some shiny new software, please find a good reason for updating it, and then make sure you test it. Please note that neither shiny or new are good reasons for updating software. I updated docker to 1:1.7.0-1. This docker version doesn’t allow you to run containers on arm architectures. It’s a pretty big set back. After I realised that the guys at Arch Linux don’t archive previous software versions, and then taking a few moments to deal with this, I spent a decent portion of Monday becoming familiar with the PKGBUILD process and achieving a working docker v1.6. A fixed docker 1.7.1 was released the day after. The rest of this week ended up being devoted to creating the first (a scoop! The first!) ARM docker Hadoop image and dockerfile, after I first picked up some knowledge on hadoop, and spent Wednesday at Jeremy’s memory management conference. There were lots of very smart people there, but I missed some of the more interesting talks I’d hoped to make. The speakers will hopefully upload their notes soon enough though. I’ve sometimes noticed that Lecturer’s seem to be disappointed by the depth they have to limit themselves to when teaching, but that upper limit didn’t exist here. I imagine that as a researcher it can sometimes feel like there are very few people who understand or appreciate what you are doing, and the gathering of like minds must be a breath of fresh air. I’m not sure I’ll have such a luxury when I hope to present the Pi 2 cloud at Glasgow’s Explorathon in September. Nothing has been confirmed yet, but we hope to have a stand there. I’ll leave you now with this preview of next week’s blog post. 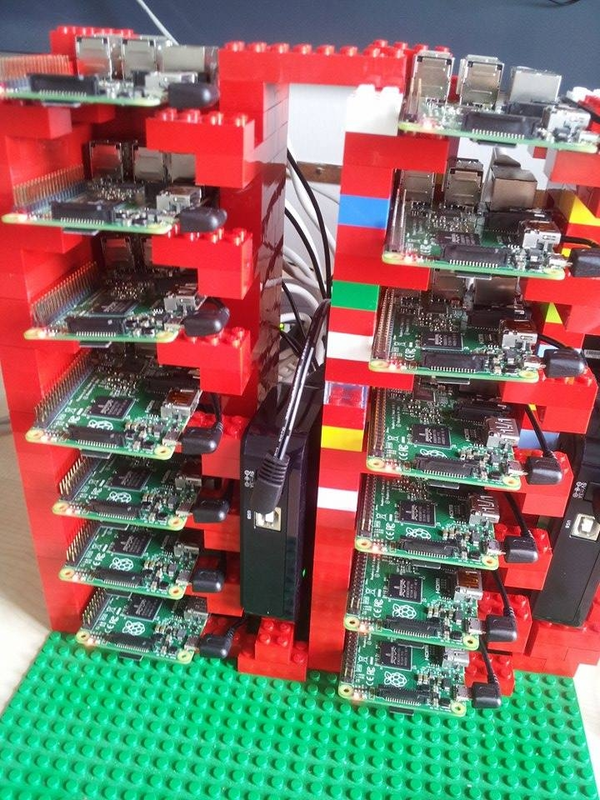 I’ve moved the Pis back to a lego rack of my own design. This was sadly necessary, as while Posco‘s 3d printed design looks great, and allows for much more airflow, its compact nature made hot swapping the Pis fiddly. The Lego design also allows easy access to a Pi’s HDMI port, making network trouble shooting just that little bit quicker. I’m sure I used to perform function over form when it came to Lego construction. I would ask myself, “does this spaceship have enough lasers?” The answer was usually no. However, I found the colour mixing on the right tower extremely vexing, and a shopping trip to a Lego shop might be in order. All very professional of course. Building this Lego tower got me thinking about other designs, and now that the Pi 2 Cloud has its first show booked here at Glasgow University’s SOCS intern-fest, perhaps it’s time to start planning a remodel with something flashier. It’s also worth noting that we’re hoping to take the Pi 2 Cloud on a tour, so if you’ve any expos or shows coming up then please get in touch with us. In general I think we made good progress this week, but I this may only be in comparison to last week. Kubernetes turned out to be something of a rabbit hole, as I’m not sure anyone has managed to follow the docker multi-node set up through on a Raspberry Pi 2 yet. We’re waiting for Google to get back to us with some help on this, but in the mean time falling back to Saltstack isn’t an awful compromise. I also had some difficulty with the Linux dd utility, which would work, but not quite, creating the correct partition tables on a blank SD card, filling them with the correct files, yet doing it in such a way that prevented booting. I worked around this by copying and pasting working boot files, but am no closer to figuring out what went wrong. Something somewhere corrupted, and as interested as I am in investigating this, I’m starting to gain a greater appreciation for what’s worth my time and what’s not (a dd operation taking 2 hours is not. Always remember to set block size!). Still, we have 14 Raspberry Pis in our cloud now, and next week I’m deploying a very cool distributed chess application to them and doing some benchmarking. I just hope numbering the Pis from 0 to 13 doesn’t prove unlucky!